Ragepeep has a very well-rounded moveset, but by far its most unique setup is with Nature's Ward. Mechanical protection should come in handy for beast Family achievements. Headbutt > Nature's Ward > Rampage > Headbutt > Nature's Ward > backline heal for maximum effect. Ragepeep is by far my favorite of any battle pet when it comes to summoning him as a companion. I normally am only concerned about the battle abilities and not the cosmetics for battle pets, but this guy is an exception. He follows me around like a real pal. Is he a bird or a beast? I don't know, you decide. S/S at 325 speed, wow, nice. 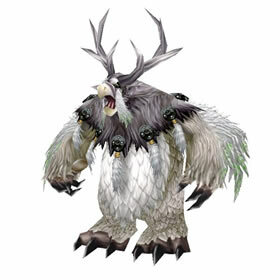 His sounds are the same as the Moonkin Hatchling.